SOLD! 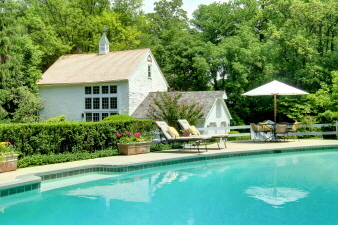 Stately farmhouse and guest barn set on 2 private acres in sought-after Wayne, Tredyffrin township. The main house has sections dating from 1795, 1833, 1917 and 1940 - lovingly maintained and carefully renovated with respect for its charm and history - this is a truly special property. Picturesque pool, springhouse and meandering stream. Stunning guest barn with soaring ceiling and wall of windos, large living/entertaining space, kitchenette & dining area plus second floor loft bedroom and full bath. A truly extraordinary home and property!